When you begin introducing fire safety concepts to your children, it is a good idea to provide them with puzzles, coloring pages and other age-appropriate activities that tie directly to the topics you are discussing. You might want to introduce a concept, give him a puzzle to solve, and then follow up with a discussion of the lessons learned from the puzzle. Kids in grades 3 to 6 can learn more about items that firefighters use by circling the terms in this star-shaped word search. It can serve as a good opener for a discussion about why the firefighter needs each tool and how important it is to report fires and let the experts help you put them out. Kids in grades 1 and 2 may be curious about fire hydrants and what they are used for. 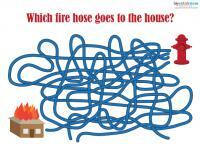 By tracing the lines, they can determine which fire hose reaches from the hydrant all the way to the burning house. This puzzle offers a good explanation about why they should be unblocked and kept in working order. It is also a good segue to explaining how fires can be put out. Download the fire safety fill-ins. This puzzle is appropriate for all elementary-age kids. Older kids can complete the puzzle without hints, and younger kids can use the answer key as a word bank. As they complete the missing letters in each answer, kids learn what they should do in the event of a fire and how to prepare an emergency plan with their families to help them get out of a burning house safely. If you need help downloading any of these printables, check out these helpful tips. 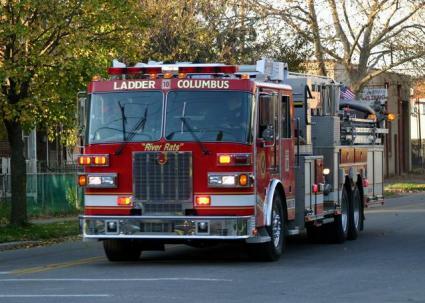 Individual fire departments around the country are doing their part to make it easy to find materials to teach kids about fire safety by publishing age-appropriate puzzles and other educational resources on their websites. Fire Safe Kids offers a variety of puzzles from crosswords to word searches to connect the dots. They even have puzzles in Spanish. The Glynn County (Georgia) Fire Department offers a selection of online fire safety jigsaw puzzles, in varying degrees of difficulty (easy, average, difficult). The California Department of Forestry and Fire Protection has a free puzzle book available online, with trivia and hidden picture puzzle and lots more. With so many free online resources for different types of puzzles about fire safety, it shouldn't be difficult to locate a significant quantity and variety of fun and educational activities to keep the youngsters in your home engaged and interested in fire safety for quite a while. Teaching children respect for fire, how to prevent fire, and the basic principles of fire safety could save a life down the road, so it is a subject you should revisit often.